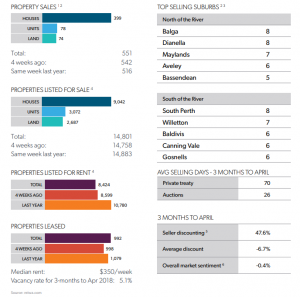 Preliminary sales activity in the Perth Metro region has experienced inclining trends during Quarter 1 2018. A total of 2,283 house transactions have settled so far for the quarter at a median house price of $499,000. reiwa.com data suggests that once further transactions settle, total house sales will count close to 5,163 with a median price of approximately $517,000. This would represent a depreciation of 1.5 per cent in median house prices over the latest quarter despite a 14.9 per cent rise in sales activity. House listings for sale in the area have increased by 13.0 per cent against the previous quarter but are 4.6 per cent lower than the same time last year. The average time to sell a house has increased by 7 days to count 67 days. REIWA Members reported 14,132 total properties (houses and units) leased over the quarter, an increase of 4 per cent over the quarter. The overall median weekly rent in the area came in at $350/week for the quarter which is unchanged from Quarter 4 2017.